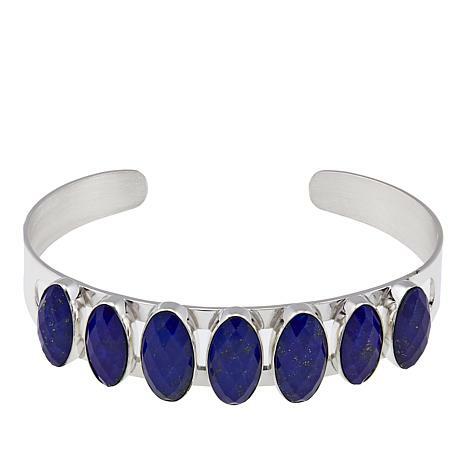 Beautiful blue lapis stones line up in style across the top of this sterling silver cuff bracelet. Checkerboard-cut and bezel-set into a simple, handcrafted base, the result is a colorful handcrafted piece as unique as the woman who wears it! 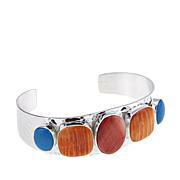 This cuff is adjustable, which makes it comfortable to wear all day. And, you won't want to take it off. Absolutely beautiful, largefaceted matching stones that stop traffic. So many compliments when I wear it, I can't count. I really prefer lapis set in yellow gold, but for the price, this is a winner. Beautiful, beautiful, beautiful! I have several of Jay's pieces and they are all stunning, but this one is really incredible. Great fit, gorgeous look and beautiful stones. Definitely a keeper! 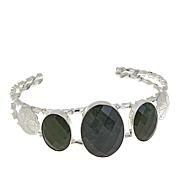 I love this classy bracelet! 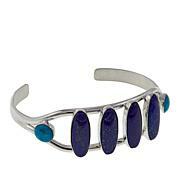 The lapis stones are of the highest quality, deep blue and lightly speckled with star-like crystals of iron oxide. 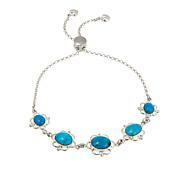 These faceted stones absolutely compliment evey other Jay King lapis piece out there.